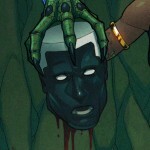 Pretty much like every issue of Power Girl, #26 was just over the top awesome. In this edition, Power Girl was attending a huge Power Girl convention in which she gave a glorious speech, twisted an I-beam of steel to show off her titanic strength, and then people stood in line to get her signature and meet her personally! And then, with a thickening plot, someone standing in line who spoke to Power Girl wanted to hijack the convention and steal Power Girl’s superpowers, but in the end ended up getting beat up by the fans themselves. I love how on the cover, there is someone who Power Girl is squeezing through next to, who is quite on the chubby side, but cosplaying Power Girl. And what I want to tell you is this-- --you may not have powers beyond those of mortal women, but you all have power. You have the power to confront apathy, to avoid cynicism and futility, to do your part to make the world a better place for everyone. Beating up bad guys is only a small part of the answer, and none of you has to do that. Awwwwwh. Power Girl rocks! I love the line, “Beating up bad guys is only a small part of the answer.” Totally hilarious. Following this, shortly in the story, is a huge contingent of cosplaying fans who are standing in line to actually meet Power Girl, get her signature on something, etc., etc. One of the fans, though, just happens to be someone from another planet who presents Power Girl with her own collegiate research showing that Power Girl is technically THE most powerful female superhero our there — then later she tries to steal Power Girl’s powers so that she can return to her home planet with those powers and defeat bad guys there! Power Girl being held captive by an enemy who wanted to steal her powers. Please kill me. Just kill me now. 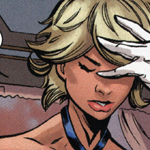 It was just such a great string of dialogue, being so nervous about being in Power Girl’s presence then losing it and being totally speechless about whatever she was gonna say. And the line, “Please kill me. Just kill me now,” awwwh, the embarrassment. We’ve all felt something like when in the presence of someone we really respect, and spacing out in our nervousness, we screw up as we’re talking to them. 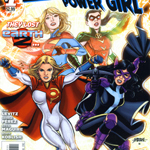 I love Power Girl comics!!!! The proceeding pages lead to Power Girl getting overpowered by the woman from the other planet, and she has a machine that transfers Power Girl’s superpowers to her! Something happens though, and several of the fans, but especially the three from the line ended up getting her powers too! and in the spirit of “beating up bad guys” they teamed together, rescued Power Girl, and then teamed with Power Girl to defeat the woman who tried to steal Power Girl’s powers. Yay for Power Girl! And Yay for the fans!!! It’s a great read. In the last couple of pages, Power Girl is chilling out walking through a park with the three girls from the convention who helped her. Power Girl is eating a large salty pretzel. They talk about how Karen Starr’s S.T.A.R. Labs was able to reverse the effects and the girls were now supposed to be back to being normal folks without superpowers. That last line is so great, “If you’re a superhero, you don’t have to wear pants.” This frame is also fantastic in that right now in DC fandom, there are a lot of Wonder Woman fans who are not happy about Wonder Woman getting pants as a part of her costume. And that is so cute that one of the girls is nicknamed “Pee Gee”! (short for Power Girl). Awwwh. 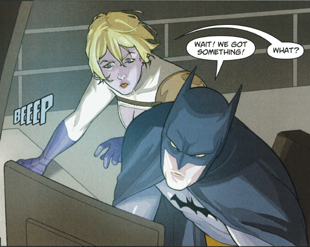 I love Power Girl comics!!!! But Pee Gee can still fly!!!!!! Cool! One of the caretakers of my local comics shop has been raving now to other patrons that they published my letter. 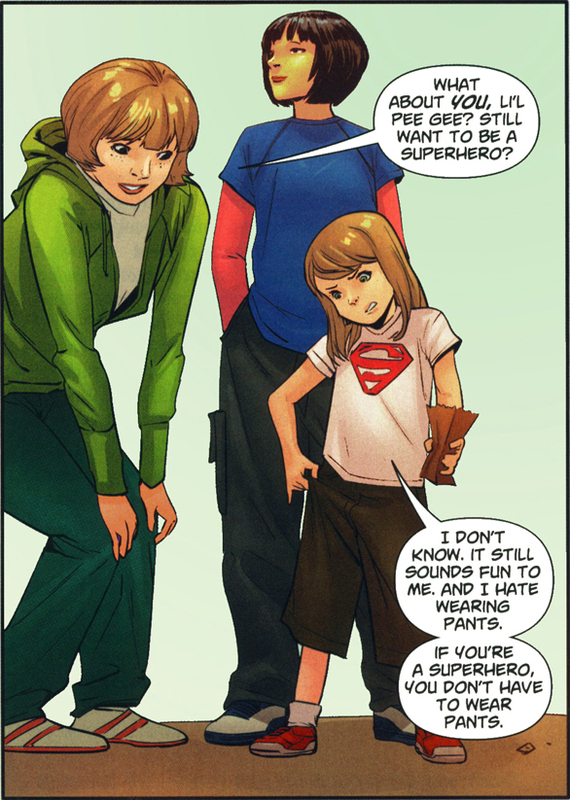 Well, I totally love Power Girl and DC now has some of my considerations and wishes to consider. 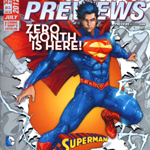 My letter was the one that said that “Prasetya is good but can’t even touch the brilliance of Basri.” I definitely still think that, but there were some really great Power Girl moments in this edition too, both in dialogue and images. 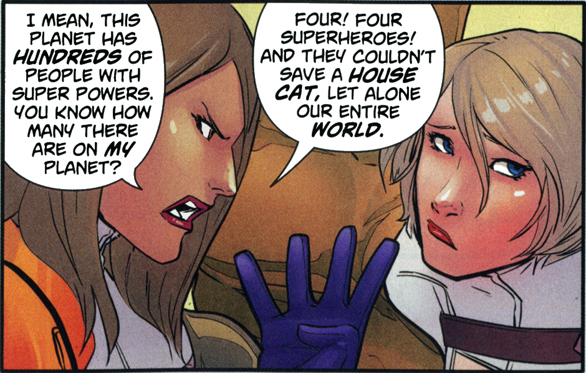 Power Girl seems to rock the house no matter what. Well, she is such an awesome superhero. DC has said that Power Girl will be in Mr. Terrific. 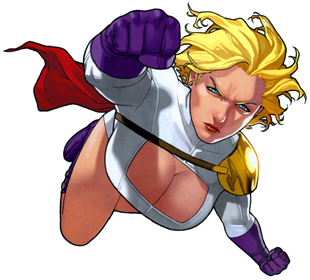 I look forward to seeing what absolute wonderfulness they’ll do with Power Girl in other expanses of her existence. Power Girl rocks!!!! Or order #26 through www.amazon.com or another online retailer.